Throughout their history, the Hospital Sisters of St. Francis have exemplified their Franciscan spirit by being a healing presence to the poor and needy. This tradition continues through Sister Maureen Fagan, who resides in Chicago, IL, and ministers to low-income women and children. 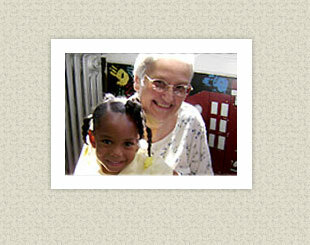 During high school, she worked at St. Joseph’s Hospital (Milwaukee) and came to know the sponsoring Franciscan Sisters. “I remember a meeting that all students attended, and I picked up a Hospital Sisters’ brochure that included a postcard that I sent in and I received a response that they were coming to Milwaukee to visit,” she added. She was then invited, along with other women from the area, to visit St. Francis Convent. “We visited for a week and lived with the Sisters.” She received a letter of acceptance from the Sisters but, ironically, it belonged to one of the other women who had visited. “So we traded letters and were all set,” she said with a smile. She made her First Profession on August 22, 1967, and earned a bachelor’s degree in nursing from Marillac College. She was certified as a Neonatal Nurse Clinician, and has completed studies in Chicago from the Institute for Religious Formation (Catholic Theological Union) and the Institute for Spiritual Leadership. Her assignments have included nursing responsibilities at St. Mary’s (Decatur), St. Nicholas (Sheboygan), St. John’s (Springfield), St. Francis Medical Center (Peoria), and Grace Hill Neighborhood Health Center (St. Louis). In addition, she has served at St. Francis Convent as the Pre-Novitiate Minister.